We met early on Monday morning for a catch-up chat and brekky. 26 Grains has several pop-ups if I understood correctly. 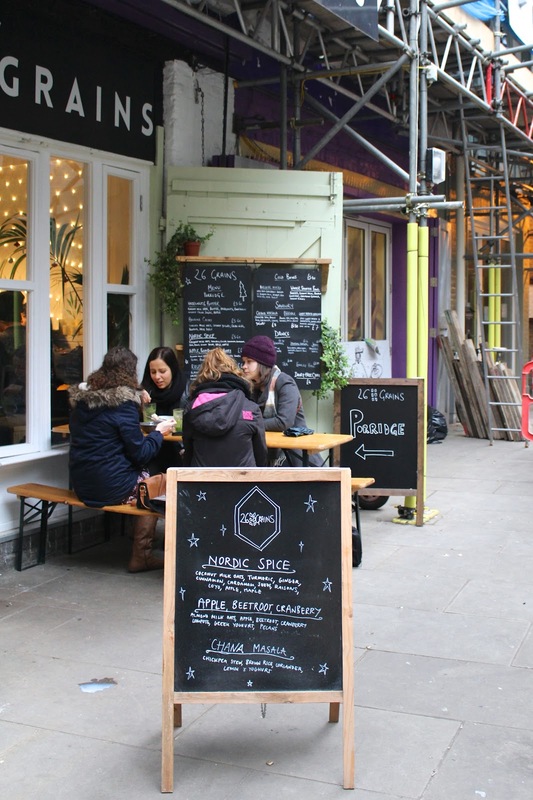 We went to the one in Covent Garden, which is very hidden away in Neal's Yard. The pop-up is tiny, with only a few little tables and an open kitchen. 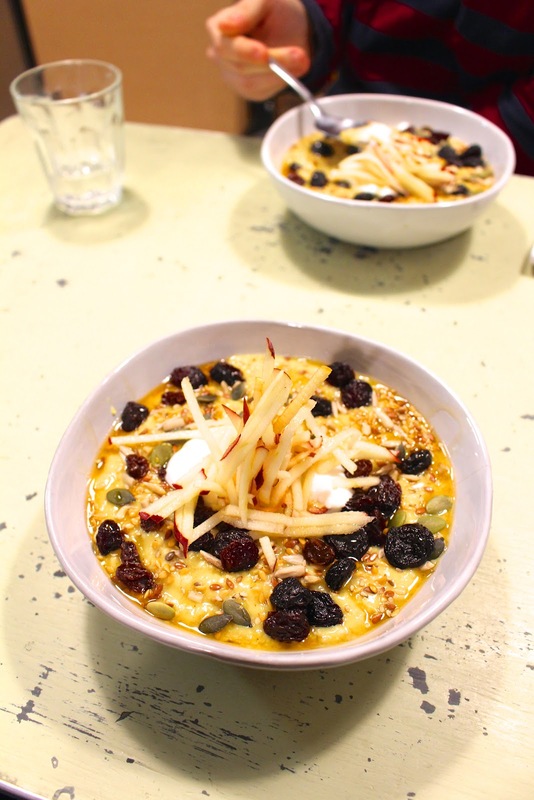 The first thing you see is big bowls of superfood goodies all lined up, and two guys busy stirring, mixing and perfecting steamy bowls of porridge. And then there was the most difficult part of that particular Monday morning: choosing what to have for breakfast. 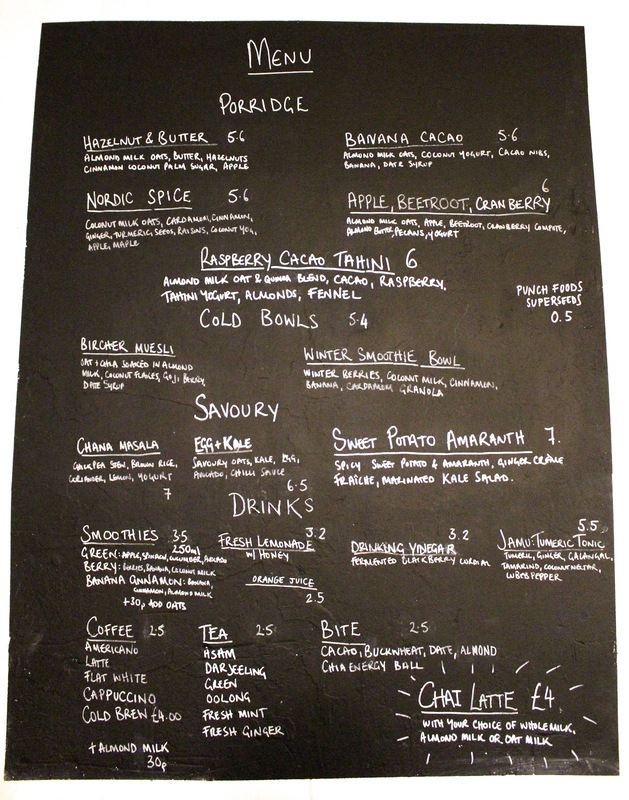 Although the (mostly vegan) menu isn't so big, it's quite hard to choose between all those tasty-sounding porridges. You can choose from hot, sweet, cold and savoury porridge. 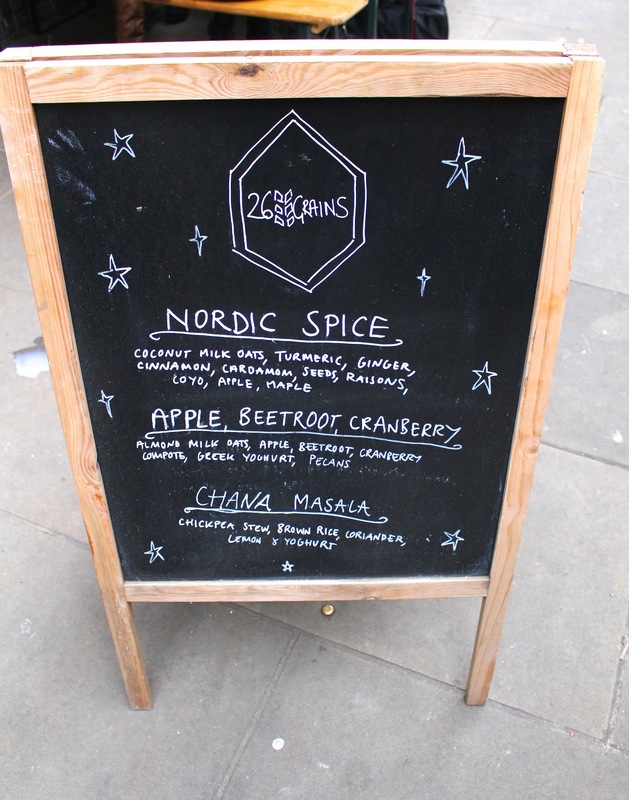 Although the savoury options were very intriguing, we both went for the Nordic Spice, which seemed to be the perfect choice for a cold & grey morning in London. After about 10 minutes, our big bowls of hot porridge arrived, and I couldn't wait to dig in. 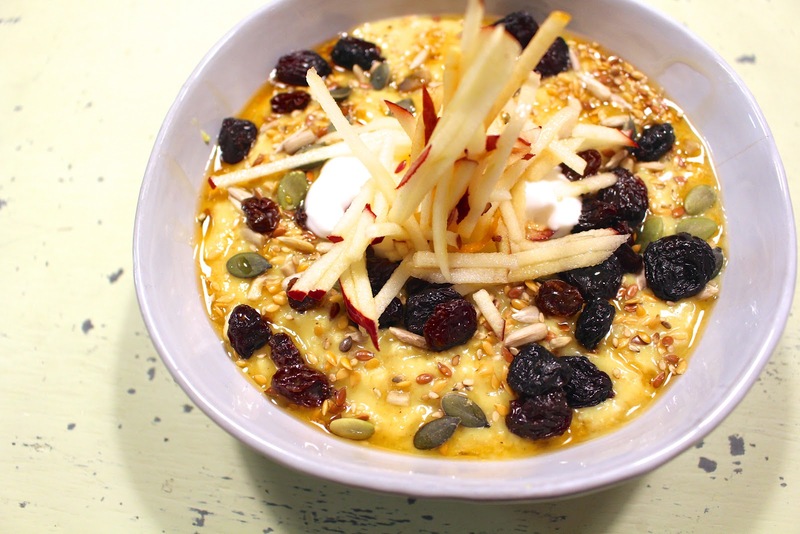 This isn't just your standard - slightly boring - breakfast porridge. It's packed with flavour and textures, and it tasted like nothing I've ever had. This is what's in it: Coconut Milk Oats, Cardamom, Cinnamon, Ginger, Turmeric, Seeds, Raisins, Coconut Yogurt, Apple Maple. A real flavour bomb, not too sweet and the perfect thickness. My favourite thing was the coconut yoghurt on top which added some unexpected freshness and creaminess. Simply amazing! The best bowl of porridge I've ever had. And completely vegan as well! If you're in London and on the hunt for a mega tasty breakfast, 26 Grains is where you need to go. 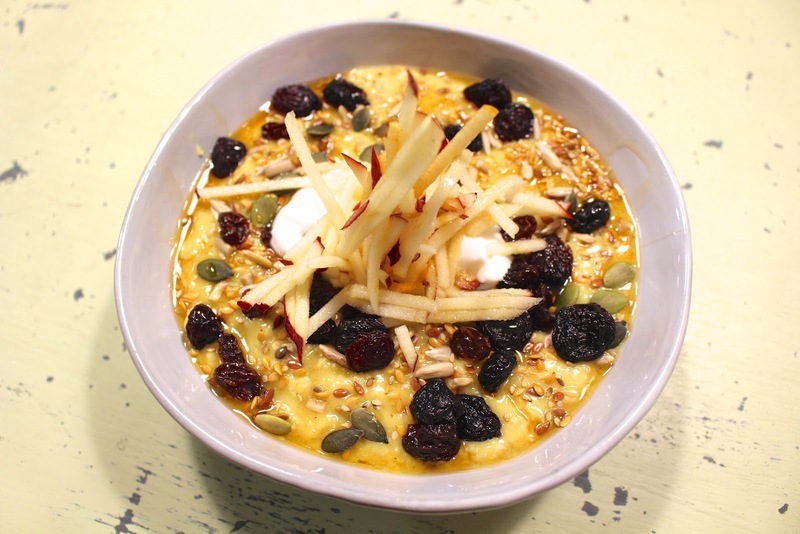 I'm going to try to recreate the Nordic Spice porridge here at home but I think it won't taste the same! I can't wait to try the other porridges when I'm in London next time. 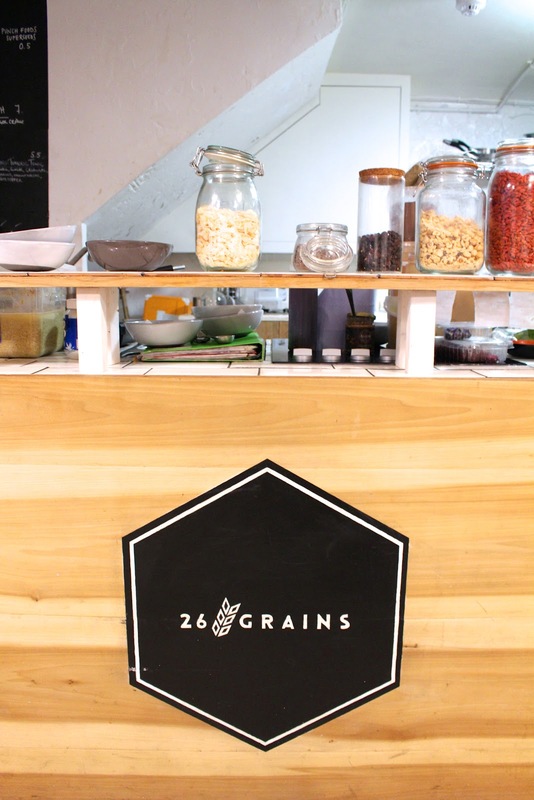 It's hard to turn porridge into something attractive and incredibly tasty, but the team at 26 Grains managed to do it. Big thanks to Sarah for taking me here, I'll definitely be back for more!